Vilém Mathesius (August 3, 1882 – April 12, 1945) was a Czech linguist, co-founder of the influential Prague School of Linguistics. Mathesius lived and worked in Prague during the early part of the twentieth century, when the city, and indeed the nation of Czechoslovakia, functioned as a haven for intellectuals in Central Europe. His early work pioneered the synthesis of the synchronic approach to studying a language as it exists at one point in time, and the diachronic approach studying the history and development of a language over time. In this way, Mathesius was able to maintain the importance of function in communication, and was not limited to Ferdinand de Saussure's static structural model of language. Together with other linguists, such as Roman Jakobson and Nikolai Trubetzkoy in the Prague circle, Mathesius developed "topical structure analysis" as a method of studying the semantic relationships between sentence topics and the overall topic of the discourse. Thus, Mathesius' work maintained a dynamic, or interactive, component, as the listener or reader is in a continuous relationship with the text, interpreting each individual sentence or unit in the context of the whole discourse. Vilém Mathesius was born on August 3, 1882, in Pardubice, Bohemia, Austria-Hungary (now in the Czech Republic). After he had received his doctoral degree in Germanic and Romance studies, he begun to teach at Charles University in 1909. Eventually, he became the first professor of English language and literature there in 1912. His brother, Bohumil Mathesius, was a professor of philosophy at Charles University. He conducted research in the grammar, phonology, and stylistics of the English and Czech languages. He was further interested in general linguistics, language culture, and general cultural issues. His works on word order and syntax are considered pioneering projects. Mathesius co-founded the Prague linguistic circle (Pražský lingvistický kroužek) in 1926, and served as president until his death. He died on April 12, 1945 in Prague. Mathesius' work covered a broad spectrum within linguistics. His 1911 lecture, O potenciálnosti jevu jazykových (On the Potentiality of Language Phenomenon), anticipated the Saussurean distinction between “langue” and “parole” and emphasized the importance of synchronic (nonhistorical) language study (with a twist in which he introduced the notion of “elastic stability”). He also produced a two-volume History of English literature (Dejiny anglické literatury 1910-15) and several Shakespearean studies. His later work was connected to the founding of the Prague Linguistic Circle. During that time, his interests turned to syntax, semantics, and the structure of discourse. In order to understand the place and importance of the Prague Linguistic Circle on the intellectual map of the time, it is necessary to look at the cultural history of Prague. During the 1920s and 1930s, Prague and Czechoslovakia were the isles of freedom and democracy in Central Europe. Czech, German, Jewish, and Russian influences all came to be mingled there. On one side, there would be Franz Kafka and on the other there might be Pitrim Sorokin, the sociologist who later became known for his Crisis of Our Age (1950). 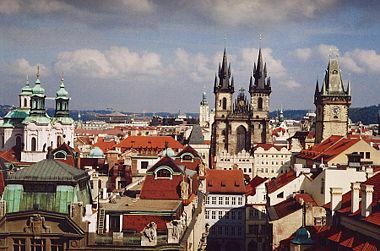 Prague became a conglomerate of numerous traditions, cultural influences, and scientific aspirations. To many intellectuals at that time, it provided a refuge, a place where they could live and work without state interference. The traditions of Ernst Mach, Albert Einstein, and Phillip Frank were still very much alive there, and many Czech intellectuals commonly spoke Czech as well as German. Thus, Prague provided a home to many leading intellectuals of various branches of learning, from fields as diverse as theoretical linguistics and electrochemistry. In 1920, Mathesius met Roman Jakobson and came into contact with a different tradition. Soon, other Russian linguists came to Prague: P.N. Bogatyrev, S.I. Kartsevsky, and Nikolai Trubetzkoy. Kartsevsky, who was a professor of Russian at Geneva University, introduced and brought knowledge of the work of Ferdinand de Saussure to Prague. Contacts were also established with German linguists H. Becker and F. Slotty. These linguists were joined by B. Trnka, B. Havranek, and Jan Mukarovsky. They wanted to establish a discussion club or a group, and this came about following the lecture by Henrik Becker entitled "Der europaische Sprachgeist" on October 26, 1926, when the Prague Linguistic Circle was born. Their, at first, irregular meetings consisting of lectures and discussions gradually developed into regular ones, to presentations at conferences, and publications that made it one of the most influential schools of linguistic thought. Mathesius was one of the pioneers of the synchronic approach to the facts of language, and this can be already found in his 1911 treatise (Mathesius 1911). However, and this has to be the most important point in his work, (apart from his later idea of "analytical comparison") he was also firmly convinced that the procedure from statics to dynamics to be the most reliable in linguistics. In line with the prevailing empirical approach, linguistics in the nineteenth century was concerned with the sound, not the content or meaning, of words. It was the school of "young grammarians" (die Junggrammatiker) that started to address more systematically the origins and development of a language, looking at its historical aspects—the approach known as “diachronic linguistics.” Their aim was to reconstruct a presupposed "proto-language." The main representative of the school of Junggrammatiker in Bohemia was Jan Gebauer (1838–1907), author of The Historical Grammar of the Czech Language and The Dictionary of Old Czech. Besides Gebauer, there was Josef Zubaty (1855 – 1931), professor of Indian studies and comparative Indo-European linguistics. Apart from the “diachronic approach,” or historical linguistics, there was also the “synchronic approach" (descriptive linguistics), entailing the study of a linguistic system in a particular state, without reference to time. The main representative of the latter approach was the world-renowned Wilhelm von Humboldt. The first person within the Czech environment who attempted to synthesize these two approaches was Vilém Mathesius. He was inspired by the work of his friend, the natural scientist, Jaroslav Peklo. Mathesius was looking for an equivalent of the classification system employed by natural history and, as he said, he found it in general or theoretical linguistics. It was Mathesius who first introduced the notion of "elastic stability" into pre-Saussurian linguistics. He felt that once fluctuations are acknowledged, we are closer to understanding living processes, if not in the language of equilibrium in thermodynamics, then at least in its spirit. This is how his famous term “diachronic/synchronic” came into being (Nadin 1995). Besides the term "diachronic/synchronic," Mathesius established another distinguishing term "static/dynamic," presumably to acknowledge the growth and development effect in language. Eventually, this most important approach to linguistics became a paper on the "Potentiality of Linguistic Phenomena" (Mathesius 1911). Thus, the term potentiality, conceived by Mathesius as synchronous “oscillation” of speech in the particular language community, came into being. The oscillation is a precondition for the development of the language itself. In his view there are some tendencies in the language itself, which, though not being as constant as physical laws, are obvious and can be statistically represented. The emphasis on statistical evaluation was another of Mathesius' early contributions. Thus, four years before Ferdinand de Saussure, Vilém Mathesius was to present these propositions that were to affect the course of the development of linguistics. A structure can be thought out and, subsequently, analyzed without considering either its historical or descriptive aspects, that is, regardless of the character of the language units and components that make up such a structure. Thus structure emerges as what is beyond the physical, the formal, different from the generic fabric, and free of historic development, free of function or purpose. With this approach it is actually irrelevant whether we are looking at a linguistic or a natural science structure. It was this analogy that in the 1920s provided the impetus that made Mathesius turn to general linguistics and formulate his ideas of "analytical comparison" (Nadin 1995). To describe coherence in a text, topical structure analysis, developed from the topic-comment theory of the Prague School of Linguistics, inspected the semantic relationships between sentence topics and the overall discourse topic by investigating the repetitions, shifts, and reoccurrences of topic. Coherence is taken to be a semantic property of discourse formed through the interpretation of each individual sentence relative to the interpretation of other sentences. Interpretation implies interaction between the text and the reader, and it was with this theoretical perspective, as opposed to focusing solely on the text, that Mathesius laid the foundation for topical structure analysis. Vilém Mathesius used the term "theme" (or "topic") to identify "what the sentence is about" and the term "enunciation" to refer to "what is said about" the theme: "the theme of a sentence announces what is known or at least obvious in a given situation and from which the speaker proceeds in his discourse, while enunciation adds new or unknown information to the discourse" (Mathesius 1975), a distinction that has also been cast in terms of the given new information. Mathesius’ method of "analytical comparison," as much ahead of its time as many of his ideas, is a suggestion so vague that neither in 1911, when he first formulated the goal of “diachronic/synchronic” research, nor at any future time did it mean more than what “synchronic” meant in the works of Wilhelm von Humboldt or Baudouin de Courtenay (Fiala 1989). While in retrospect it is clear what prompted Mathesius’ original focus on synchrony, and the manifest according to which only synchrony allows us to grasp the nature of what Saussure defined as "langue" (language, in opposition to "parole," or speech), it is less clear why structure emerges as such a powerful instrument of thinking, unless structure comes face to face with its adversary, history, and adopts it (Fiala 1989). There were many critical distinctions vis-a-vis Saussure made by the Prague School, and by other structuralists regardless of their epistemological affiliation, which is natural in any newly-born scientific discipline. Nevertheless, Mathesius’ idea of "analytical comparison"—based on functionalist analysis of semiotic systems in relation to social functions, such as communication, rather than treating them purely as autonomous forms (in contrast to Saussure and Hjelmslev)—may have, as an idea, withstood the test of time. The Prague Linguistic Circle, of which Vilém Mathesius was co-founder, was one of the most influential schools of linguistic thought in pre-war linguistics. Mathesius, together with Roman Jakobson, Nikolai Trubetzkoy, and many others began to meet in the mid-1920s to discuss issues of common interest. Their, at first, irregular meetings consisting of lectures and discussions gradually developed into regular ones. The first results of the members' cooperative efforts were presented in joint theses prepared for the First International Congress of Slavicists held in Prague in 1929. These were published in the first volume of the series Travaux du Cercle Linguistique de Prague. The Théses outlined some of the most important concepts—such as the approach to the study of language as a synchronic, yet dynamic, system, the functionality of elements of language, and the importance of the social function of language—that were explicitly laid down as the basis for further research of the world’s linguistics community. Mathesius is also memorialized by the Vilém Mathesius Centre for Research and Education in Semiotics and Linguistics at Charles University in Prague. Mathesius V. 1907. Obsahový rozbor současné angličtiny (Content Analysis of Contemporary English). Bulletin of the Royal Czech Socisty, Prague. 1907-1909. Mathesius V. 1975 (original 1909). A Functional Analysis of Present Day English on a General Linguistic Basis. Mouton, The Hague, Paris. Mathesius V. 1915 (original 1910). Dějiny literatury anglické I - II (The History of English Literature I - II). Prague. Mathesius V. 1911. On potentiality of linguistic phenomena. Bulletin of the Royal Czech Society, Prague. Mathesius V. 1928. On linguistic characterology, Actes du Ier Congrès International des Linguistes. pp. 56-63. Mathesius V. 1929. Functional Linguistics. Proc. First Congress of Slavists, Prague. Mathesius V. 1975 (original 1939). "On information-bearing structure of the sentence Slovo a slovesnost 5." Harvard Univ. Linguistics Dep. : Cambridge, MA. Mathesius V. 1947. "Cestina a obecny jazykozpyt" in Soubor stati. Prague: Czechoslovakian Academy of Sciences. Mathesius V. 1982. Jazyk, kultura a slovesnost (Language, Culture and Literature). Odeon, Prague. Doubravová, J. The ‘Cercle Linguistique de Prague" and the "Wiener Kreis." Charles U., Prague. Fiala, J. 1989. "Pražský meziválecný strukturalismus" (Structuralism in Prague between the Wars) in Matematické modely morfogeneze (The Geometry of Living: Mathematical Models of Form Generating). ZP CSVTS at Fgu CSAV, Prague. Nadin, Mihai. 1995. "Dynamic and Structure" (Chaos, Dynamic, Dissipative Strukturen) Plenums-Vortrag auf der internationalen Konferenz Strukturalismus an der Technischen Universität Dresden, 23.4. Saussure, Ferdinand de. 1966. Course in General Linguistics. New York: McGraw-Hill. This page was last modified on 29 October 2008, at 18:20.